A stylish mix of old and new, celebrating a perfect union in an airplane hangar. What could be more cool? Turning these gorgeous shiitakes, picked fresh the morning I purchased them, into a silky mushroom soup may have been the highlight of my week. We are working through the mother sauces in Culinary 101 right now, so I'm becoming well-versed in the six fundamental sauces and their derivatives. Have you ever made a mac-and-cheese? You've made a béchamel first and turned into a delicious cheese sauce based on a mornay. Ever had turkey or roast beef with gravy? That's a velouté in its most basic iteration. Enjoyed Eggs Benedict one weekend? That's topped almost always with a hollandaise, a lemony buttery bit of heaven brought together by egg yolks and the magic of emulsification. Sweat the onions, celery, and mushrooms in 1 tablespoon of the butter and add the thyme stem. Add the velouté and bring to a simmer. Cook until the vegetables are tender, approximately 15 minutes and remove the thyme stem. Purée the soup. Return the soup to a simmer and thin if necessary with the chicken stock. 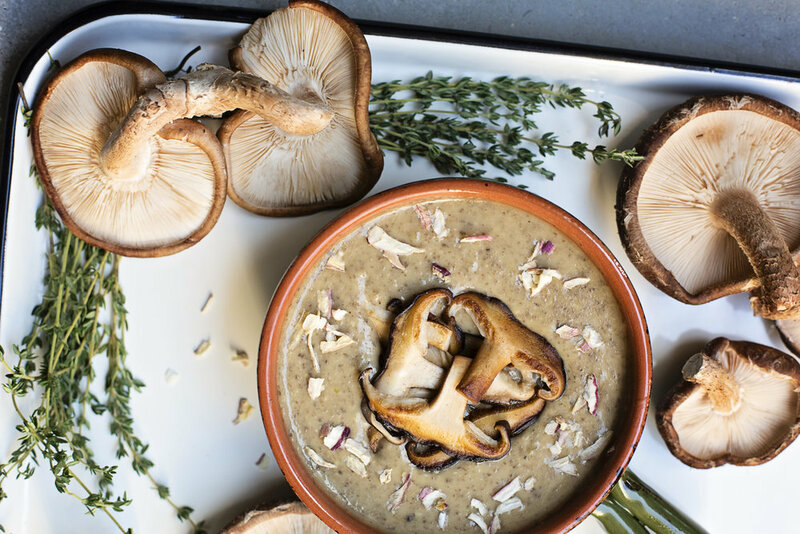 While the soup is coming up to temperature, sauté the remaining mushroom slices in the remaining butter, adding a splash of stock if necessary. Season the soup with salt and white pepper to taste. Ladle into bowls and garnish with a few mushroom slices and the dried shallots. Heat butter in heavy saucepan. Add the flour to make a blond roux. Gradually add stock to the roux, whisking constantly. Bring to a boil. Reduce the sauce to a simmer and continue cooking for thirty minutes. Sauce should reduce a bit. Cool and refrigerate or use in your cream of mushroom soup. I love vegetable soup, especially in the Fall. There's really something special about assembling a set of ingredients that are some of the healthiest things on the planet into a thoroughly satisfying meal. Making your own veggie stock is equally as satisfying and so very easy. You can even use the scraps from putting together your mise en place for the soup to flavor your stock--and it only needs to simmer for thirty minutes before its ready to be used. In a soup pot, brown the beef in the butter. Remove and drain carefully. Sweat the mirepoix (carrots, onion, celery), leeks, and turnip until tender in the fond left behind. Add the garlic and sauté lightly. Add the broth and the diced beef and bring to a simmer. Add the bay leaf, thyme and keep simmering for around 20-30 minutes. Add the tomato concassée, corn for an additional ten minutes of cooking. Remove the thyme stem and the bay leaf and season to taste. Garnish with the sliced beets and parsley for color and flavor. Add oil to a stockpot and sweat the vegetables for 10 minutes. Add the remaining ingredients and bring to a simmer—keep at a simmer for 30 minutes and then strain, cool, and refrigerate or use in your vegetable soup.